Launched in May 2016, Super 6 is a video slot machine from Realtime Gaming offering 729 ways to win. Inspired by Chinese tradition and culture, the six-reel slot machine takes you to the Far East where you will meet Caishen, the Chinese god of wealth, and many items from Chinese culture symbolising well-being. The overall atmosphere of the game is fulfilled with a soothing oriental soundtrack providing you with a pleasant gaming experience. You can benefit from the paying structure the game provides as well as various rewarding special features including free spins, Wilds and multipliers. However, the best part of the game is that it pays both ways, so as long as you land identical symbols in succession you will be awarded, no matter if they form a winning combination left to right or right to left. Although the theme itself is not very innovative as you can find many Asian-themed slot machines on the market, we have to say that the game boasts elaborate visuals and animations. The reels are populated with symbols such as fans, lotus flowers, scrolls, dragons, rabbits, envelopes, lanterns, firecrackers and Koi fish and no playing cards symbols, which we find great. Scatters are represented as the letters and a number included in the title of the game, while coins stand for Wild. The game offers 729 ways to win left to right and vice versa. The coin value starts at $0.01 and goes up to $1. As the bet is configured to 30 coins, you may wager from $0.30 up to $30. To launch the game you may press the spin button or you may opt for up to 1,000 automatic spins which can be stopped manually. You may also choose the event which will stop the autoplay option. On the right side of the reels you may enter the Help&Rules menu where you can find all the needed information on the rules, payouts and the bonus features offered by the game. Wild appears on the reels 2, 3, 4 and 5 and substitutes for all regular symbols thus helping you complete as many winning combinations as possible. Besides, each win with Wild included is doubled. 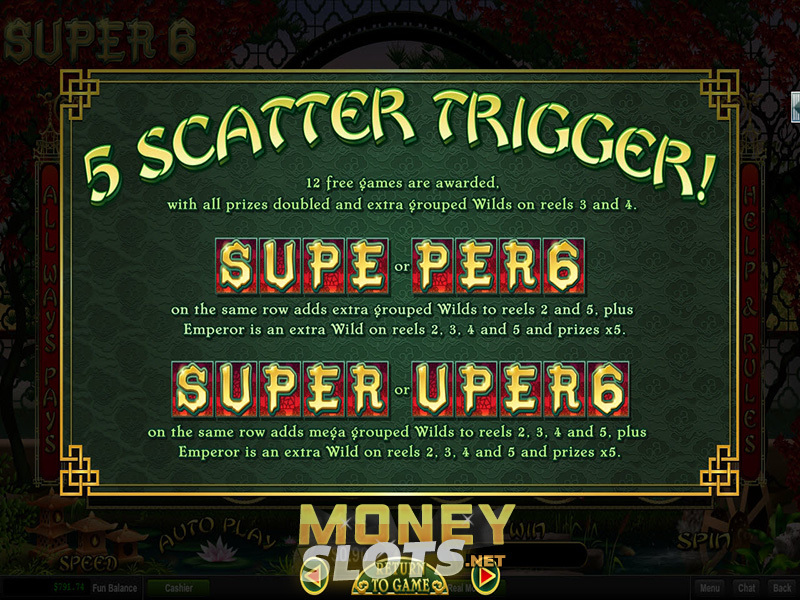 Collect four or more Scatters left to right or right to left to trigger Super 6 feature. Four Scatters deliver 8 free spins, five Scatters award 12 free games while SUPER 6 title rewards you with 25 free spins. During bonus game all prizes are doubled and additional grouped Wilds are added to the reels 3 and 4 while and free rounds may get even more enhanced if Scatters appear on the same row. Depending on the number of Scatters and their combinations during the free spins feature, you may trigger even more Wilds and 5x multiplier. Along with the online version, Realtime Gaming released mobile version of the Super 6 slot which can be accessed via various mobile devices. Whether you use a smartphone or a tablet, you may enjoy all its features on the go as long as you have a stable Internet connection. Immerse in the oriental world with the slot machine offering innovative structure and features and you will surely enjoy a rewarding and relaxing gaming experience due to its calming soundtrack and elaborate visuals. Place SUPER 6 on a single row and you may expect huge winnings.